I always liked a bigger return section. That way there is a bit more forgiveness as far as having to top it up all the time goes. 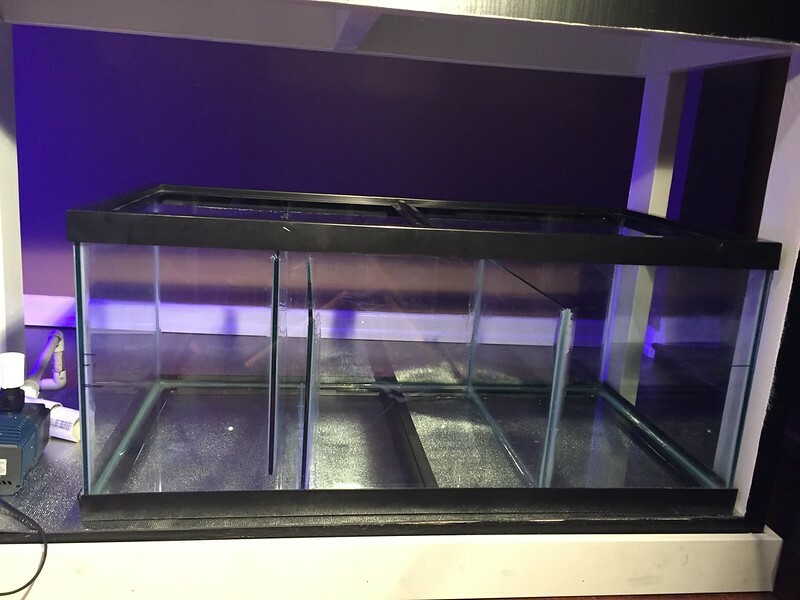 The refugium section doesn't need to be that big, yeah it would be nice to have a whole other tank as a refugium but not entirely necessary. Just saw through the bulkhead and then buy new ones for the new plumbing. I finally have baffles in my sump! I went with a simple design and the husband did a pretty decent job with the silicone. I did a water test on both the main tank and the sump, and all is well. Whew! I have to admit I was nervous filling up the big tank in the house. It was quite the job emptying it out afterward. Now onto the plumbing. Went to JL and they had no 1.5" bulkheads in stock and no ETA for pending shipments. Then I couldn't find any pvc fittings at Home Depot - what? I thought they have everything. Will check out some other places this week. Nice work on the sump! Did you order black pipe yet? You can get coloured pvc pipe from www.formufit.com. They supply pipe to BRS and its much cheaper to order straight from them. As far as 1.5 " bulkheads, you might have to order from BRS. A little bit of a hassle with the crappy exchange rate and shipping but what can you do? Any idea how much shipping is with them Warren? It's just the nature of the beast with shipping. You are either willing to pay or not for a specific item. Having a PO box in Blaine can also help reduce the cost. I would not paint pvc pipe. It always chips at some point. I order a fair amount of stuff online (pick up in Blaine) but having said that, after mooning over all the pretty colours, I decided to stick to something that's a bit of a myth in this hobby - a budget. I think I'll just paint the pipes black. 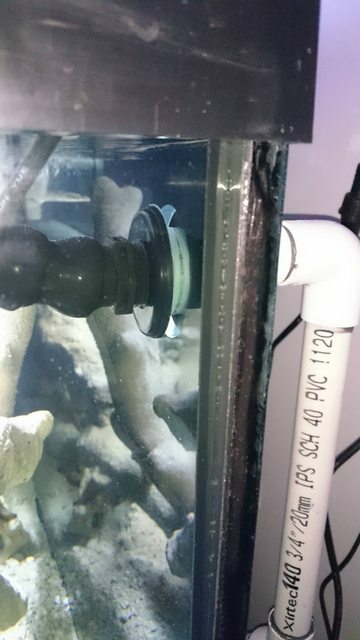 No one will ever see them behind the tank and I can use the $$ towards something else (like coral!). Sigh...it's a compromise. The white part is really bugging me. Not sure what it's called, but I'll have to take out the bulkhead as it's glued in. Yes bulkheads with threads on both sides are best. unless your using slip on the inside and not gluing your standpipe or elbow. 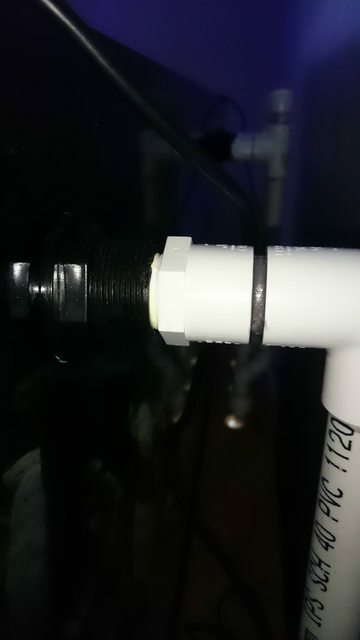 If you use slip glued on the outside and the rubber seal ring needs replacing you have to replace that whole section of plumbing. Ok thanks for the info. I've been trying to read up on this stuff but it's hard to get a lot of detail. It's a bit of a slog going thru this learning curve but it's a real benefit to get a better understanding of how the tank runs. 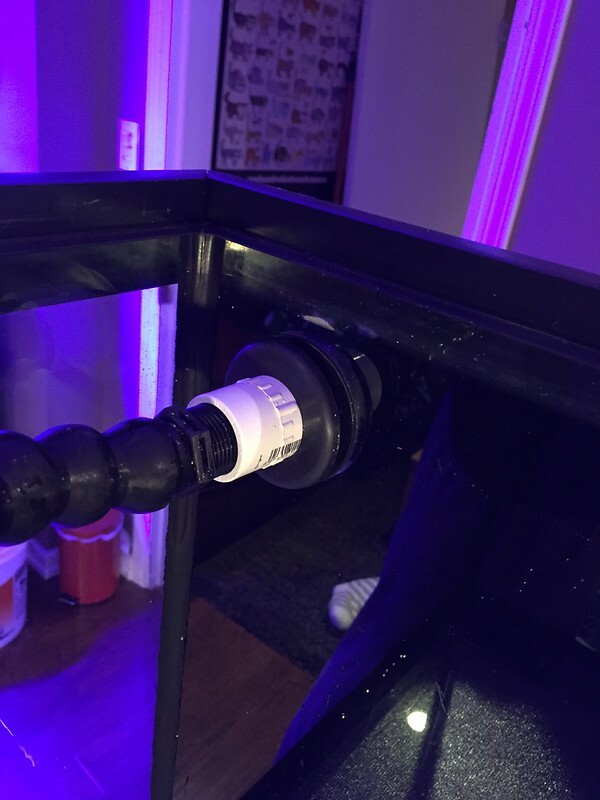 I'm trying to sit through the BRS 52 Weeks of Reefing, and they did mention that it's best you're able to take stuff apart for maintenance.